I’m finding it hard to remember when I first went to Glastonbury, the grand-daddy of all British summer festivals and arguably one of the best music festivals in the world. Perhaps is was when I was at University. It was definitely in the 90s, which by all accounts means I must have been in my teens (coff). The special mix of hippy travellers, being able to camp in the festival grounds and world class bands made it something special. A 24 hour cornucopia of sights and sounds and chai tea, amongst other things. That first year we had weather that could only be described as ‘traditional English summer’ – a mix of occasional sun, showers and chilly damp evenings. None of that dampened my enthusiasm, and Glastonbury found its way into my heart. Glasto is many things to many people. No two people ever have the same festival, and indeed it often seems like every other festival is a pale shadow of Glasto’s glory, a sliver of a slice of the complete pie (mmm, pie) on offer. Even with the increased security requirements imposed upon the festival by police and locals, Micheal Eavis and his daughter have managed to keep the feeling of the festival relatively intact. Even if the crusty travellers are sorely missed, the replacement areas such as Arcadia introduce some of their own weird and wonderful magic, assuming you can get in there. 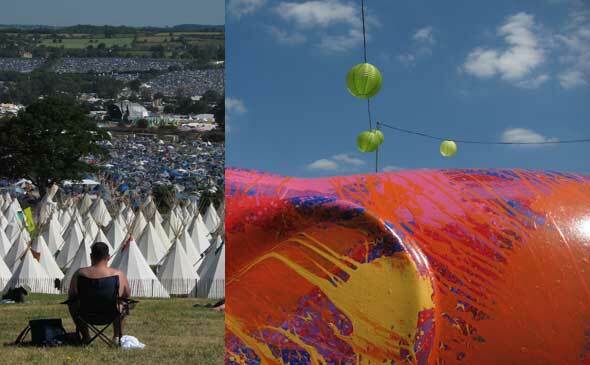 Yes, Glasto is now extremely busy and crowded at times, however well organised it is. So much so that we gave up trying to see Arcadia at night for fear of being crushed alive in the herd of sheeple. This Glasto was special though. The 40th anniversary of the first ever festival gathering, so after a break of six years I decided to go along and even managed to get tickets, and I’m glad we did. Perfect weather, even to the level of being too hot. Great bands such as Slash, The Orb, Gorillaz*, Chromeo, Grizzly Bear and my favourites Orbital and The Stranglers. Then there was the joy of Mr B the Gentleman Rhymer, seeing The National & La Roux for the first time (with Heaven 17 interlude) and many other smaller acts we stumbled across during the four days we were there. In fact most bands were going special guest crazy, just wish we’d found out about the Thom Yorke secret gig before it happened. Ah, The Stranglers.. a band I’ve not seen since I was 17 and refused to see after Hugh Cornwall quit as lead singer. However singing along to their classics with a crowd of folks who were old enough to know better was highly enjoyable and liberating – Hugh, wish you’d been there too. As for Orbital, the disappointment of their Brixton Academy set was swept away by an outstanding, outdoors Other stage extravaganza. The perfect way to end a festival. Hot, sweaty and smiling – and wishing we didn’t have to ever leave. Roll on next year! * I have to pass comment on the Gorillaz set.. Yes, it wasn’t the perfect Glasto set, as Glasto crowds really want a hits laden extravaganza. What Damon and his friends gave us was instead a full on, epic rendition of their latest album, Plastic Peach, with a sprinkling of their other hits and a chance to hear something different. For his part, Damon should have realised this would be a hard pill to swallow and perhaps eased it by at least announcing your guest stars as they came out – we’re not all musos! Bobby Womack, I apologise for thinking you were Horace Andy – and Lou Reed I apologise for thinking you were someone wearing a Lou Reed costume. Truly this was a star studded wonder of a night, but it wasn’t what the crowd wanted. Especially when Damon got a bit too demanding in asking us to learn the lyrics of Pirate Jet in the style of an aggrieved schoolmaster (“something about taps running for 100 years, Sir?”). And even when the crowd did get what they wanted in the form of Shaun Ryder singing ‘Dare’, Shaun himself was, as usual, not up to the task, being more content to grin at the crowd as his co-singer sang all his parts. I guess he’d visited Bez earlier in the day, host of his own tent somewhere on the site. At the end though, the tribute to Dennis Hopper was truly moving and the final two songs culminating in a Snoop Dogg infused & enthused Clint Eastwood was a rabble rousing success. Thanks, Damon & friends, we should never have doubted you.